The Christian Wife Life: Operation Christmas Child. Tomorrow is the last day to drop off your Operation Christmas Child boxes! What is Operation Christmas Child? you may ask. But basically, it's a Christian organization that collects shoe boxes full of gifts and supplies for needy children around the world. The shoe box that you put together may be the only thing a child gets for Christmas, and is SO worth your time and effort. Here is their mission statement:The mission of Operation Christmas Child is to demonstrate God’s love in a tangible way to needy children around the world, and together with the local church worldwide, to share the Good News of Jesus Christ. How awesome is that? I love getting involved with their organization and have been making Operation Christmas Child shoe boxes since I was little. In high school I got to go to their giant warehouse in Charlotte a few times to help inspect boxes. It's a fantastic Christmas tradition that involves so much more than just eating food or decorating - you're making an impact and showing God's love to others in a practical way. I definitely want to make this a Shelley family tradition. I made a box for a 5-9 year old little girl. Have you participated in this before? Does anyone do this with their kids? If you want to put together a box make sure you drop it off by tomorrow! Aw! Your box is too cute! And I have heard about this before, but I have never actually done it, just because there is no "drop-off" area near my home. Next year I will have to search this out more intently, the mission is wonderful. I should post a picture of mine. I did mine for a 2-4 little boy. 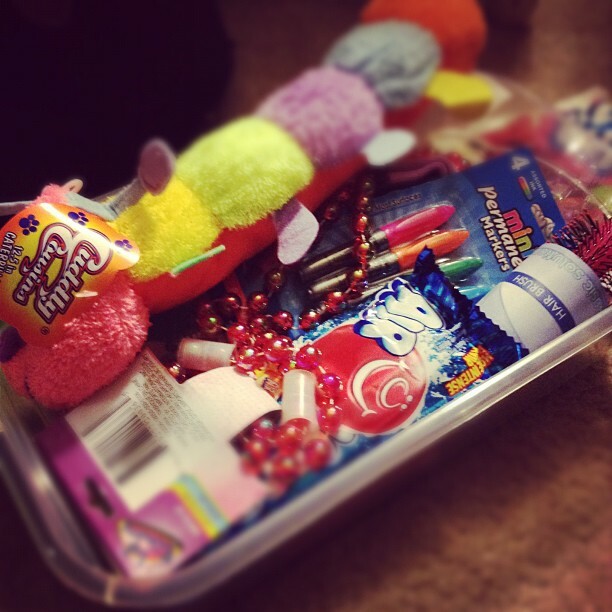 I filled it with tons and tons of stuff. Like toy cars, trucks, a stuffed santa, dinosaurs toys! He is going to love it! Such a great cause and organization!!! Thank you SO much for posting this! I've got all the stuff for my box and need to drop it off tomorrow! Would have forgotten about it if I hadn't read this. My parents worked as volunteers once at their headquarters examining boxes to ship out. I have a cool story I'll email you!